Final EMAS conference, project EMAS/IPPC/SEVESO was held on December, 11st, 2014 in Belgrade (big conference room, Chamber of commerce of Serbia). The main results of the project has been presented as well as individual presentations of three companies from Serbia who implemented EMAS. Welcome speeches was given by representatives of: EU delegation in Serbia, State secretary of the Ministry of Agriculture and environmental protection and EU project. – Rade Ostojić (Ministry of Agriculture and environmental protection of Serbia) – presentation. Welcome speeches: Dušan Stokić (Chamber of commerce of Serbia), Stana Božović (State secretary, ministry), Richard Masa (EU Delegtion, Serbia), Riccardo Guaggiato (EU project). presentation. – Schaeffler Technologies GmbH (Germany) – presentation. 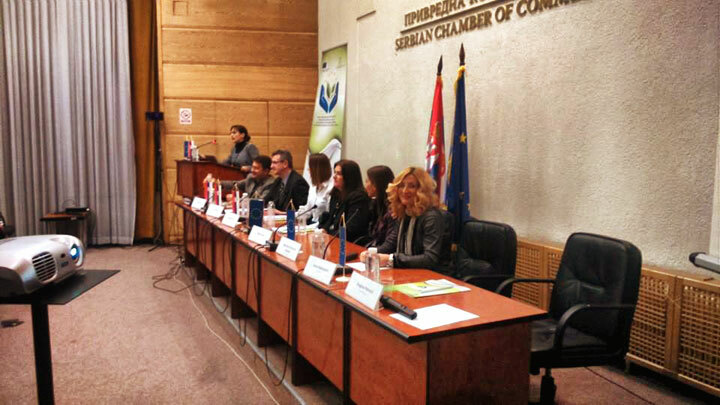 Place: Chamber of commerce of Serbia, Big conference room, Terazije 23. Number of participants: about 90. Based on the overall interest and good practical expirience shared among the companies, it can be expected that this event will exelerate the futer EMAS implementation in more Serbian companies.